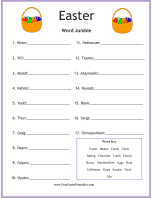 This printable letter, to be mailed from the Easter Bunny, can be used to assuage a child's fear that the Easter Bunny will not be able to find the boy or girl's new home. 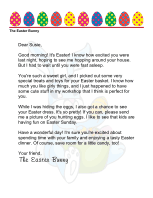 The bunny assures the kid that the house's address is part of his route. There are only a few days left until Easter morning! Do you have trouble waiting sometimes? I sure do! I'm spending all my time in my bunny workshop painting eggs and making candy just for you! I heard that you moved into a new house this year. That's pretty cool. I'll bet your room is really neat and that you have lots of new neighbors and friends that you can play with. You might be worried that I won't be able to find your new home, but bunnies are smart and sneaky! 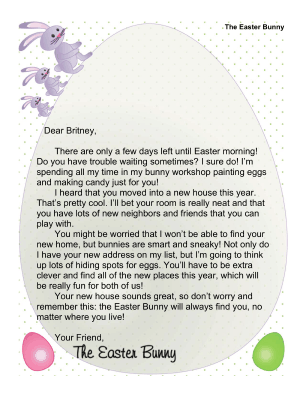 Not only do I have your new address on my list, but I'm going to think up lots of hiding spots for eggs. You'll have to be extra clever and find all of the new places this year, which will be really fun for both of us! Your new house sounds great, so don't worry and remember this: the Easter Bunny will always find you, no matter where you live!